Girls und Panzer supplement for GF9 - Tanks! Tanks! – Girls und Panzer expansion. This is a completely unofficial development, created by the GuP fan-base, who by some fortunate turn of events happen to be fans of GF9 – Tanks! game system. This is a document in development and will be updated as play-testing goes ahead. As pointed out, being completely unofficial, no copyright infringement is intended, and this work is completely open-source – i.e. no financial benefit intended from this work. At the start both teams roll for initiative. The winner may decide to keep the initiative or not. The player without the initiative may then decide upon the board edge and must deploy all tanks that are not in flank marching (see "Flank Marches" below), the player with the initiative may then decide which of his tanks he will put into ambush and which of them he will set-up openly. Those that are in “ambush” will have their locations secretly noted as to which terrain feature they are located “hidden” in. They are only revealed if they shoot, or an opponents tank moves by within 4 inches at any point in its’ turn. There are two competition types, one is “annihilation match” and the other is “flag tank immobilization match”. In the first instance, the side wins that manages to immobilize all opposing tanks. With the second instance, each side nominates a “flag tank” in their force. This is the target of all tanks in the opposing side, once taken out, you loose and the match ends immediately. If sides are composed of allied contingents, then still only one tank is nominated as a flag tank. So, one “flag tank” per side. • Low tier match: maximum of 5 tanks per side, maximum of 150 points allowed. Tank and crew upgrades are included into these points limits. • Mid tier match: maximum of 10 tanks per side, maximum of 300 points allowed. Tank and crew upgrades are included into these points limits. • High tier match: maximum of 20 tanks per side, maximum of 600 points allowed. Tank and crew upgrades are included into these points limits. For every 50 points (i.e. batches of 0-50 points) below the force limit, your side may take one of the universal rules as detailed below. There is no restriction upon tank nationalities – any wild mix is allowed. You may or may not tailor your force to a specific national identity, or school composition. The choice is completely yours. During “flag tank immobilization match”, the flag tank gains bonus 1 to it’s initiative, bonus 1 to it’s firepower and if it is a medium or light tank, gains bonus 1 to it’s defence score. 1. Improvisation: All of your tanks will either gain initiative (win the roll off) automatically at the start of the turn, or you may place “decoys” at the start of the game. “Decoys” are in fact dummy tanks – you may place models on the table and secretly write down who are the dummies, if any or all of them are. Note, if you win the roll off, you may place ambushes (as described earlier) AND place decoys – perfect for completely ruining your opponents plans. 2. Scout schooling: All of your tanks gain scout rules. Scout tanks reveal all hidden tanks within 24 inches at any point in their move. 3. Sniper tankery: All tanks within your force do extra damage when they score critical hits (on top of any damage caused by special effects). If a “lucky shot” option is drawn, then instead of doing extra damage, perform not 2 but 4 damage points onto the enemy tank. 4. Cautious: All your tanks gain ambush capability, even if you loose the initiative roll-off. However, you may not choose table edges, regardless if you actually loose the initiative roll. 8. Speed monster engine modifications! : up to All (you decide how many and which ones) your tanks gain “Fast” special rule. However, if you are medium to light tanks, you loose one hit point for this. If your are Heavy tank, instead of loosing a hit point value you must roll a D6 every time you use the “Fast” rule (i.e. every time before you perform a third manoeuvre), on a 1 or 2, engine overheats. Roll further, 1-2, your tank is destroyed (engine catches fire, a immobilized), 3-6, you remain stationary and do nothing else. 9. Defensive strategy: After you have deployed your tanks, they are considered "entrenched", they get extra two dice for defence. However, as soon as any of them moves, this advantage is lost for the moved tank for whole game (doesn't this remind you of Maginot academy?). All light tanks (those that actually are designated as lights - check wikipedia or source-books on tanks if not sure if your tank is a light, but I am pretty sure you will definitely know if it is a tankette though) automatically gain scout rules (repeating this rule above: scout tanks reveal all hidden tanks within 24 inches at any point in their move.). Also, when rolling for initiative, for every light tank or tankette you have, you gain a bonus point to the roll. The tank gains +3 to it's initiative, however, it will have the loading speed halved and so can only fire every other turn (it may be useful to use cotton or some other means to mark when the tank fired in this case to remember which one may not fire next turn). Scouts may return to their tank at any point in the game at the start of a turn, but only if their tank was not fired upon last turn. I will be shortly developing rules and stats for some non-existant tanks in the rules set. So watch this space for CV33 (thanks to those who made their inputs, I'll be integrating them together), T26's, T60's, T70's, BT42's, KV1's and KV2's, Type 89's and Type 95's and etc. and etc. I like the idea of the universal rules and like to game those out sometime to see how well they play, see how worth it they are for 50pts. Thank you again for compiling all this together! I have a bunch of resins on the way to put together and paint getting a few schools ready to play with friends eventually. Great! Cheers for those referrals. Note I meant that for every batch of 50 points. So, if max is 300 points, lists between 300-250 get 1 such skill, lists between 200-250 get two such skills, and note that only two skills per school, which means that if for the same 300 points, you do 180 say, you may only still pick two universal rules and then max out on upgrades. I guess, test this one out and let me know if this sounds reasonable of a limitation, or should it be just lifted for more imagination and creation. They may not be worth those 50 points however, so require play-testing and tweaking as you go. Saying that, friends who are up for such "experimental" works, I rarely see, so my play-testing will include solo-gaming, so there may be occasional inputs from me as well. Also, if additional thoughts come to mind on more "school universal" rules, throw them out. More than welcome to add suggestions, corrections, and etc. and etc. I hope this will be a community development rather than just me babbling the crazy ideas in my head. Also, note the flag-tank special rules, made such that players would feel a bit more inclined on committing them. If you think there are better ways of doing this - let me know, I am still not sure that this sounds attractive enough to commit such an asset. Feel free to add to the discussion, hope to hear from some people soon. Re: Girls und Panzer supplement for GF9 - Tanks! Hello all, just a few thoughts visited me since last time and I thought of some rules to add. They have been put in italic to keep track where the changes are. Critique is welcome. I will convert from italic to normal in 7 days time. More additions put in. Old Italics removed and new ideas are italicized to track changes easily. Loving the Scout detachment idea, gives even a heavy tank team a chance to find the hidden ones without falling into a trap. I also hate it that you've added to my work load, I have to make a 1/100 Yukari now! That to-do list keeps growing and a knife to the thumb has me slowed down with the postman also adding to the list. Love the work you've been doing with the concept. Have you had a chance to play any more games yet to test out the newer ideas? OCDPaul wrote: Loving the Scout detachment idea, gives even a heavy tank team a chance to find the hidden ones without falling into a trap. I also hate it that you've added to my work load, I have to make a 1/100 Yukari now! That to-do list keeps growing and a knife to the thumb has me slowed down with the postman also adding to the list. Love the work you've been doing with the concept. Have you had a chance to play any more games yet to test out the newer ideas? First of all I was wanting to give you a rep, but for some reason it highlighted your message as red (which for me doesn't sound like a good thing), let me know if I have accidentally reported your post instead of giving it a rep, still figuring out the controls on this forum. 1/100 Yukari? Wow, now that is dedication - I was thinking of abstracting it in my games with just a marker on the card and not worry about where the model is on the playing surface. I got this idea after reading the Girls und Panzer Little Army II - the battle between Belwall academy and Kuromorimine academy (yes, I usually despise comics, but just couldn't help it, it was the only comic that I could not put down and read all of the GuP series). I am still figuring out how to deal with the school trait of Chi-Ha-Tan academy, I want it to be playable and not "charge and die" - if that would be the case I think it would become the least favorite faction and won't be played for a lot. The "defensive strategy" is from the Gekitou! Maginot-sen desu!! manga, just for reference. Anyway, back to the play-testing question, maybe I should get in contact with the anime or Tanks computer game fans here in Adelaide, that way I may get some people off the comps and to the table (comps are really devouring people today, much less face to face talking, which to my opinion gives mush more enjoyment than looking at the comp for almost the whole life face-booking and computer gaming, social games give the opportunity to converse about history and even go as far as doing psychological warfare - more thrilling I think, you won't be able to do that over the computer really). I am planning to do a solo game soon though, I had a major teeth surgery and now recovering, so not at work and not burdened by too much stuff, so I may have some free time today or tomorrow to give these rules a test run. I will give you a short report once that goes along and will say my opinions on that one. If you manage to get some games in, let me know, would like to hear your thoughts, since it is more of me being a theoreticist at the moment and not a practical person - creating rules without even properly play-testing them I mean. No problem about the red, not sure what it means but no negative effects as far as I can see! Eventually I want to get into sculpting and casting and molding some figures and rare tanks. For tank commanders I really want to do an order of these bit.ly 2ELDGmh some green stuff to add floof to Miho's hair and I'd have a recon Yukari Besides maybe one 3D printer site, I haven't found an ARL44 in 1/100 scale so that might be my first sculpting job, then mold and do resin casts. Again why I love the show, I don't think I would have ever even known about that one till it showed up with BC Freedom. For Chi-Ha-Tan I like the starting idea of your Mobile Mass from the 89 you posted. Have the main tank and any tag alongs move together in the Movement phase(since its a charge, have them able to move up to 3 as temporarily fast tanks), and then add firepower score to a single shot. For a Flag tank match, having a bunch of light tanks charging and all firing at one target could be a real game winner. The other idea I had, either as a different idea for school trait or a custom upgrade card for Doctrine: Something like Duck-Dono Strategy, that when this tank is out of line of sight of the enemy it can enter Ambush Status in the nearest terrain. This one just came to me typing so its obviously in rough form for you to use or lose. Most of my games are with family during holidays or my niece when she's off for summer vacation so it will be a few months before I can get much play testing and that might be modified for her age as it is. Ideally I want to have a bunch of armies built and painted that I can take to friends to play, the hope being that they'll give it a try without any initial investment on their part (and it gives me an excuse to keep collecting more and more ) I love that tiger meme btw, I have huge respect to the engineering and design that they did, but eternally grateful that they didn't have the manufacturing capability to make it work. For the gaming its easy to swing either way, too historical that the game is complex and not fun vs too generic you lose the flavor. The basic TANKS rules could easily be bent to cover all sorts of games, I mean if you wanted to make the cards for them, you could do Star Wars AT-AT's and AT-ST's ....ect and play them as tanks easy enough. Like you, I like having FoW style rules for the historical itch scratching and the TANKS rules for spending 30-60 min just having fun pushing around armor on a table. Also, why I'm so excited about having GuP rules for this, because in their universe you have tanks at their peak and highly tuned max vs tanks also at their max. 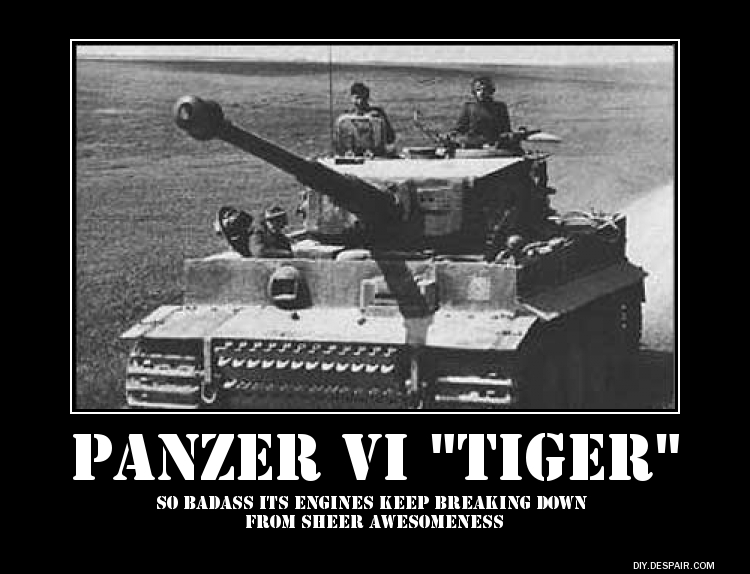 The Maus just exists and can cruise around a city, the Jagdtiger ACTUALLY shows up to fight, and didn't break down and get self destructed 10 miles from the battlefield. The friendly competition of the game just fits so well with the fictional competition and teams. Plus the possible recruitment for new players to actually play games with. Don't feel like you need to rush for a solo report either, hope the recovery from the surgery is going well! I should find the time to do some solo games too, when I can I'll try giving all the feedback I can. The background for a post that has received a rep was set to red. I've now reset it to green, a much more positive and less alarming colour. No probs with the report - didn't end up doing the game anyway, too much stuff to do - research essay on history, planning dog shows (yes I am a breeder of Norwegian Elkhounds) and renovations planning (while I lie in my bed I still do work) no respite, sheesh, maybe will come one day that I can truly relax a bit more. Anyway, thoughts for the Chi-Ha-Tan club is good, I shalt exploit it as you said, just give me a bit of time to think over it if it needs change or additions, but it will be called "We're the Chi-Ha-Tan tank club!/There is always a CHARGE!" skill. As for the 3-D printing, I am leaning towards making a Sensha Rentai army for FoW made exclusively of Type 97's Chi Ha tanks (which I will use for Chi Ha Tan as well, even painting their insignia), but with a caveat - all my tanks will not be purchased anymore, but 3-D printed from my own design in Google SketchUp (already began the work), so that one should be interesting to see how it goes. No worries, same for you, no rush, write the report whenever you get time for a play-test. In the meantime the work will slowly continue. Yes, the fluff of GuP is what got me into it, armor rolling around, but it being not war but a friendly sports match, that when ends, all participant gather for a friendly after-match discussion - everyone is alive, maybe just bruised a bit. As to the Admin, thanks for changing the colour - red does usually indicate that something went wrong, it sits somewhere in the sub-conscious place of the brain. More thoughts upon the ever-developing supplement: How to handle large battle-fields and tanks seeking one another. This may sound hazy at first. If something is not clear, let me know and I will try to elaborate better - this is just following my thoughts that I had while thinking how I could simulate the battle on the grander scale - i.e. how tanks would scout to find each-other. To simulate the effect of a very large battle-field, before engaging, the two forces must find each-other. Create a map of the whole field, distinctly showing what terrain features are where (i.e. where there are lakes, hills, built up areas, forests, hills, etc.) and divide into square sectors numbered, for example 1-32 (number of squares depends on the size of battle-field). Each force will need a separate counter for every tank they have in their force (designate them with recognizable symbols, i.e. a marker for each tank). Both forces start on the opposite sides of the field and in one square. Players must take it in turns moving the tanks: each counter may move into one adjacent square, and is done secretly. To do this, you will need to create a small contraption which will look like a bunch of small shelves - e.g. a good way to do this is to use match-boxes glued together, every sliding end will be numbered and these number correspond to the sector numbers on the map. The retractable parts represent the area you move into - slide open the box, place your counter, close, this way your tank has moved into that area. Players take turns, one must turn away not seeing the mini-shelves, and the other player secretly distributes all their tank markers in the corresponding map locations however they wish to do so. Then, once complete, the other player has their turn to do the same, with the previous player turning away not to see where opponents markers are placed. As soon as you open the box, and find your opponents markers in there, you have found your opponents tanks - place terrain representing as close as possible the terrain features in that sector of your grand map and play out the battle as written in the supplement rules with the tanks you have in the same square - all the initiative orders and special rules are used exactly as you would in a normal battle. Should any of you wish to pull out, exit the battlefield to the side you wish to exit (assuming you can reach it physically before being shot down) - make sure to you both agree what number of the sector is adjacent in that direction of exit (a good suggestion is to know where the "local North" is on the map and with respect to the playing surface). Place the exited tank markers into the respectively numbered box in your contraption (however, if you run into more tanks, you must first play out that battle, before the opponents tanks giving chase may be moved). Note: this may be a messy business, but it is my take upon trying to expand the playing field beyond what is a feasible table space, and one that would add more spice to the game... suggestions are very keenly awaited for.